I was honored to be a mentor for DC Shorts Mentors, a four-week long workshop on how to write, produce and market films. Each weekend brings a different set of mentors on how to write a script, work with actors, shoot a film and then market it to the world. I was there for a day to contribute my expertise as a screenwriter. I won the Film DC Screenwriting Competition for my screenplay Mount Pleasant. For winning the contest, I had a chance to visit the set of The West Wing during its final season. I’ve also taken part in the 48 Hour Film Project, interviewed filmmakers for On Tap and generally been a part of the local filmmaking scene – including being a judge for DC Shorts and other screenplay contests. You can spend your entire life reading books about screenplays. From saving the cat to getting past the reader, a whole industry exists to instruct aspiring screenwriters (and take their money). I read a bunch of them and they created a cacophonous racket in my head. There’s so much advice, it’s overwhelming. Stick to the basics. Stick with Syd Field and Screenplay: The Foundations of Screenwriting. Field is the master; everyone else is a lesser copy. And if you have formatting questions, Elements of Screenwriting Style is indispensable. It’s like Strunk and White for screenplays. My screenwriting journey began when I friend of mine gave me a couple of scripts to read. We had been in a writers’ workshop together, discussing short stories in a basement conference room. She shared with me the classic of the genre which, believe it or not, is the script for Rocky. Yo! It is the archetypal hero’s journey. Luckily these days, plenty of scripts are online at sites such as Simply Scripts. Find the scripts from your favorite films and read them. I read a bunch of them – On the Waterfront, Taxi Driver, Swingers, Raising Arizona, Fisher King. Read them closely, study how they begin, how suspense is maintained and how they conclude. Find the writing habit that works best for you. I like writing in coffee shops – something about watching other people work makes me feel like I better work as well. And I love coffee. Turn off social media and tell yourself that you’re going to write for the next couple hours, even if it’s just a single word. Beginning writers get hung up on screenplay format. It is tricky and different from what you’re used to seeing. 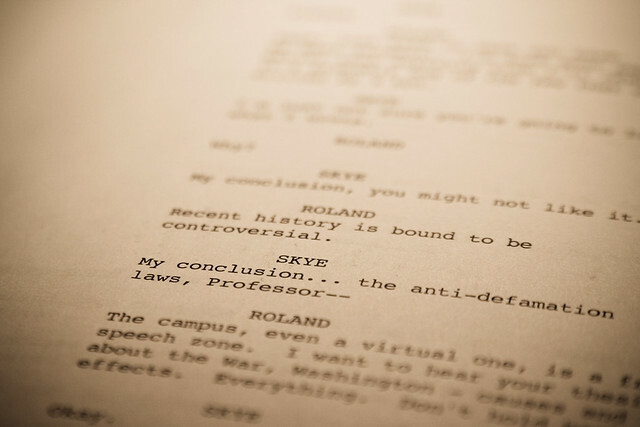 You’re going to need software to turn your story into a correctly-formatted screenplay. Fortunately, there are numerous options in screenwriting software, from the free Celtx to the industry-standard Final Draft. I also like Montage, which is for Macs. Remember, buying expensive software doesn’t make you a screenwriter; completing a screenplay does. You will not catch your own typos or idiosyncratic turns of phrase. You need an editor. Find a friend, loved one or a disinterested party to read your finished script. Does it make sense? Do they understand it? Is everything spelled correctly? The simple step of reviewing your work is something that most people don’t do – and will be appreciated by screenplay contest judges. Writing is a solitary art; filmmaking is not. Find a community of writers and filmmakers to join. This can be an online community, like Done Deal, Zoetrope or Amazon Studios. Or connect with people IRL. Volunteer with DC Shorts to meet fellow film fans and help select movies for the festival. Join Women in Film and Video. Take classes at Arlington Independent Media or the Writer’s Center in Bethesda. In the DC area, the opportunities are endless. The dream of every screenwriter is to see their work on the big screen. And there are an endless number of screenwriting contests promising a chance at that dream. A lot of them are… questionable. What screenplay contests will make a difference in your life? Austin Film Festival and Conference – It’s a great festival and a great conference that attracts major Hollywood players. Winners go on to have careers in the industry. Nicholl Fellowships – Sponsored by the Academy Awards. All you need to know. Sundance Screenwriters Lab – If you have an indie mind-set, this is the contest for you. DC Shorts – Yes, as a judge for this competition, I am hopelessly biased. But the finalists get a live reading before an audience and the winner gets $2000 to turn their short script into a film. That’s a great deal. Don’t wait for someone to give you permission to make a movie. These days, anyone with a DSLR or an iPhone can be a filmmaker. Think you need a lot of money to make a film? The delightfully creepy Man in 813 won Outstanding Local Film at DC Shorts and cost $100 to make. It was shot on a Canon Rebel T2i, a digital camera you can get at Costco. Think you need a lot of time to make a movie? Join a filmmaking team and make a movie over a weekend for the 48 Hour Film Project. Think your no-budget film will look like crap? Read The Angry Filmmaker to get tricks of the trade. In summary, the screenwriter’s journey is a difficult one. You are conjuring something from nothing. But movies depend on it for they begin with the written word. By studying your craft, taking it seriously and doing things yourself, you can bring your vision to the screen.